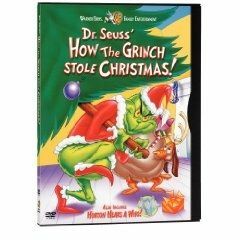 In "How the Grinch Stole Christmas," the green, grouchy Grinch starts out hating everything and everyone. But his sweet dog Max is just the opposite - cheerful, fun-loving and ready to try anything. Who wouldn't adore this lovable mutt? He's cute, cuddly and never seemingly bothered by the abuses heaped on him by the evil Grinch. If you're a fan of the Grinch's Max the Dog, read on to learn more about this amazing cartoon canine. From Amazon: Children will delight in finding out how the grumpy Grinch met Max, his lovable dog, in this simple-to-read book based on the popular Dr. Seuss characters. Full color. Have you noticed these mistakes? These trivia tidbits are from IMDB. Watch for them the next time you view "How the Grinch Stole Chistmas." - The antlers that the Grinch puts on Max's head at first have a fifth prong on the back that is hidden behind the dog's body when he tips over. After the Grinch saws off the extra branches and Max straightens up, the prong is gone, even though the Grinch didn't saw that one off. - When the Grinch is cutting Max's antlers, the cut lines appear on the antlers before he starts to cut. Also in that scene, the pieces of antler that he has cut off and have fallen to the floor suddenly move a few inches closer to Max. - The number of antlers on Max's head keep changing throughout the special. At some points he has two, while at other times he has three. Max and The Grinch are just two of the Dr. Seuss characters you'll find at the Dr. Seuss National Memorial Sculpture Garden at the Springfield Museums in Springfield, Massachusetts. Springfield is the birthplace of Theodor Seuss Geisel. Dr. Seuss' stepdaughter, Lark Grey Dimond-Cates, created the bronze sculptures. 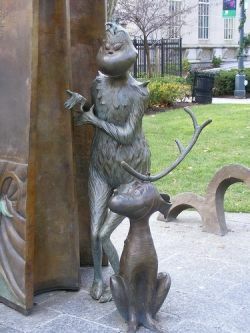 Max and the Grinch appear in the sculpture called "The Storyteller. The sculpture depicts a "Seussian storytelling chair, backed by a 10-foot-tall book with the text of Oh, the Places You'll Go! with Gertrude McFuzz perched on top and the Grinch and his dog, Max, peeking around the side," according to the museum website. Max later penned his own book to tell about his life with the Grinch. Meet the Grinch's best friend--Max, the mangy mutt who has his paws full keeping his master in line. Now, for the first time, Max reveals his side of the famous Christmas story, giving readers a rousing, rhyming dog's-eye view of the Grinch and his life on Mount Crumpit. 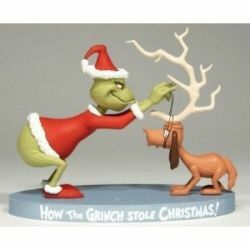 This figurine represents one of the best scenes from How the Grinch Stole Christmas, when The Grinch puts antlers on poor little Max. I am a fan of anything Seuss, and of anything dog - so the Grinch's Max is a definite favorite. Blessed. My favorite cartoon at Christmas time, looking forward to watching it again this year! Really great lens. Max is my favorite cartoon dog of all time!